When you think about your home's security, don't overlook the garage. It's one of the most vulnerable areas for thieves to rifle through for power tools, sports equipment and open cars. Here are some security measures to take for the garage. 1. Get a Security System. 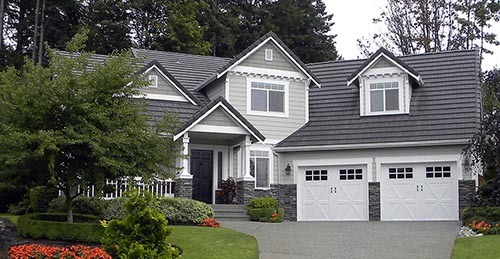 Make sure a home security system integrates with your garage. We can help with garage door security issues. 2. Use Motion Detector Lights. When a person or animal is detected by motion, the lights go on at night and cycle off with your preset time. 3. Secure the Garage Door. Steel doors are best and can resist forced entry. Use a locking device that usually comes with the garage door when you are gone on vacation. We can help evaluate your garage door security. 4. Cover Your Windows. Does your garage have widows? If so, cover them so snoopers can't peer inside. 5. Don't Leave Remotes in the Car. Thieves can break into a car parked outside the garage door to go for the remote opener. Mini-remotes can be attached to your keychain, or use a garage door app. The app will also let your know if your door is open. We can help with your garage door security issues, serious decisions you are probably thinking about but may be unsure on how to begin. Call Sumner Garage Doors at 253-922-6280 for info.